Fredrikstad was named in honour of the citizens of Fredrikstad, Norway who commissioned and paid for her as a rescue boat in 1968. During her 20 years in service she helped save 11 lives while performing more than 600 rescues. In 1988, the boat was decommissioned by the city and sold to a private individual from Oslo, who used it for salvage and exploration. In 1996, she was purchased by Peter de Savary of America's Cup fame, who stripped the boat to bare frames for a major restoration and refit that transformed Fredrikstad into the stunning yacht that she is today. 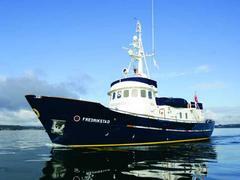 Under the stewardship of her most recent owner, Fredrikstad underwent many refinements including a $500,000 refit at Pendennis in 2006. Accommodating six guests in three cabins, her asking price has been set at $1.45 million for a piece of floating history.